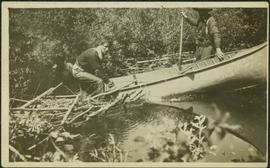 Photograph depicts three men guiding canoe through water. 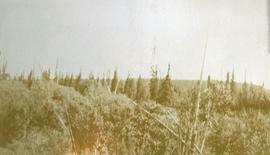 Bushes and forest slash in foreground, bushes on swampy shore in background. 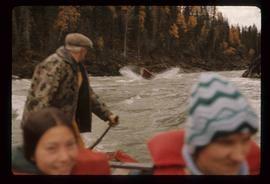 Handwritten annotation on recto of photograph: "Bill Barnett at stern of canoe." 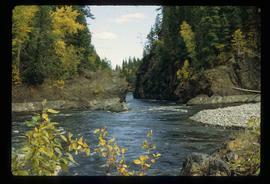 Photograph depicts a view from the railroad looking toward the river and mountain beyond at Billings siding. 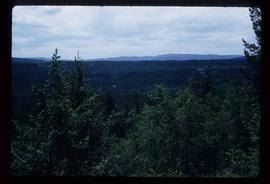 Bird's-eye view of Prince George and surrounding forested area. 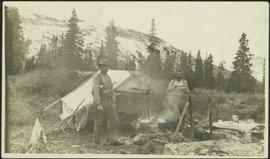 Printed annotation on recto reads: "Prince George, B.C." 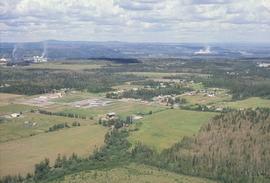 Birds Eye View of Stewart B.C. 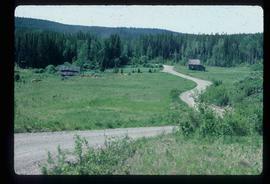 Photograph depicts a panoramic view of Stewart B.C. 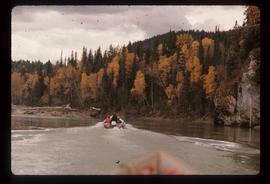 Annotation on front "Bird's Eye View" "Stewart, BC"
File contains slides depicting birds and wildlife at unknown locations. 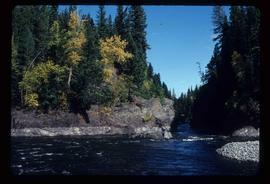 Wide angle perspective of the Bitter Creek glacier, with trees visible in the foreground. 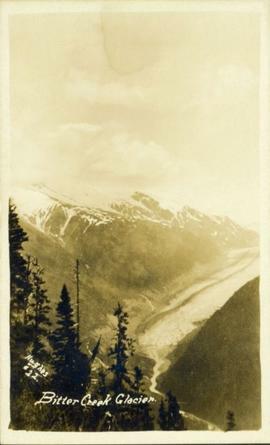 Printed annotation on recto reads: "Hughes #22 Bitter Creek Glacier." 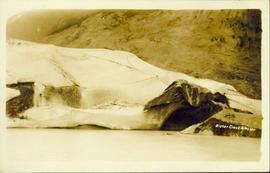 Photograph of a large glacier. Printed annotation on recto reads: "Bitter Creek Glacier." 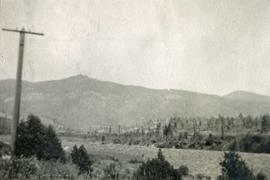 Image depicts a view of Blackburn Schools, possibly taken from Tabor Mountain. 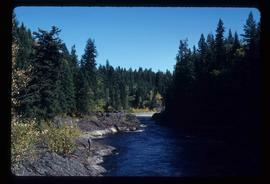 Image depicts a view of Blackwater in the country near Punchaw, B.C. 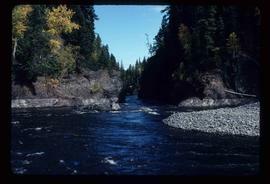 Image depicts Blackwater River, B.C. 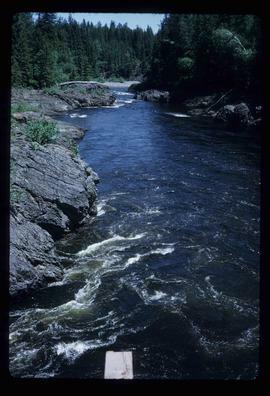 Image depicts the Blackwater River. Image depicts an abandoned cabin and shed on Blackwater Road. 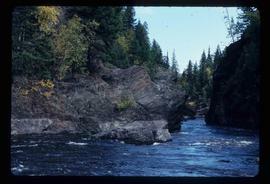 Photograph depicts a large body of water the shore edged with forest and low hills. 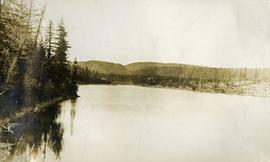 Photograph depicts a body of water surrounded by sparsely forested hills and low mountains. 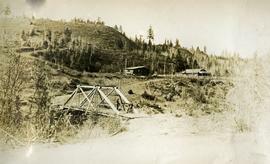 Photograph depicts three men standing on a bridge in the foreground, a cabin and fenced house in the midground, sparsely forested hills in the background. 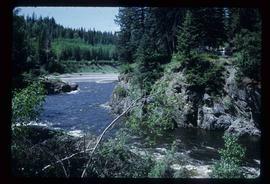 There are telegraph poles with wires between the bridge, cabin and house. 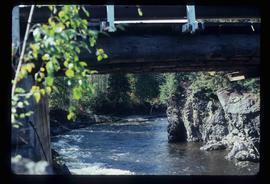 Photograph depicts a view of the Blackwater bridge from downstream. 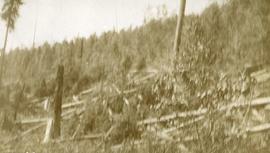 The cabin, house and telegraph poles in the background. 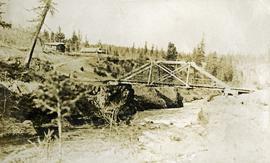 Photograph depicts the Blackwater bridge and cabin. 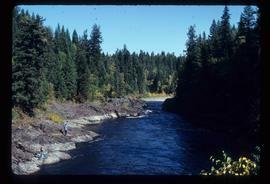 The forest in the foreground has been roughly cleared. Four construction workers stand to left of blasthole drill number "604" among many empty cardboard boxes. 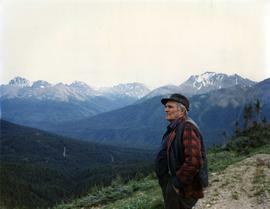 Mountain range can be seen in background. Photograph depicts two blasthole drills on bench in mine, old garage visible in centre background. Snow-covered mountain range in background. 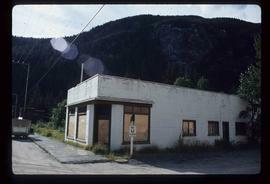 Image depicts a boarded up building in Stewart B.C. There is also a sign that reads: "No U Turns." 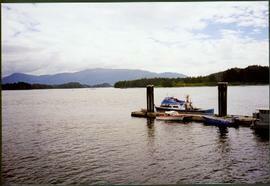 Town on right, water on left, mountains in background. 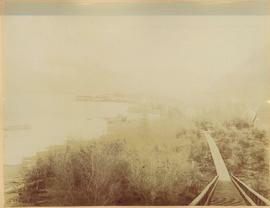 Boardwalk and forest trees in foreground. 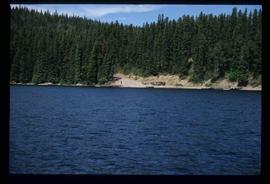 Image depicts a boat launch; it is possibly at War Lake in Carp Lake Provincial Park. 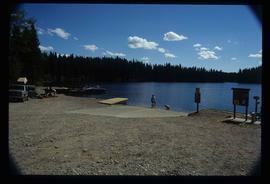 Image depicts a boat launch with several people nearby; it is possibly at War Lake in Carp Lake Provincial Park. 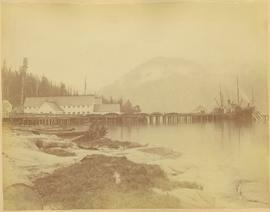 Photograph depicts boat on right, cannery on left, dock crossing midground in front of both. Shore in foreground, hills in background. 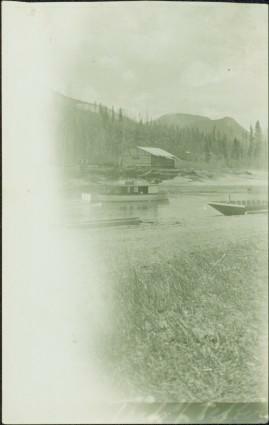 Image depicts a boat on a lake, possibly in Longworth, B.C. 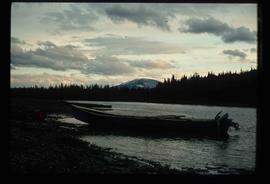 Photograph depicts small boats tied at dock on lake with mountains visible in background. 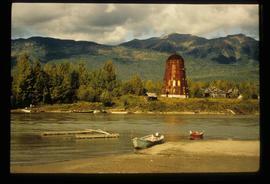 Image depicts several boats on what appears to be a river, and an old beehive burner. 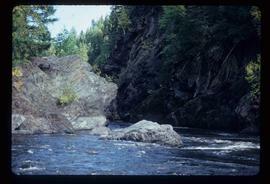 The location is uncertain. 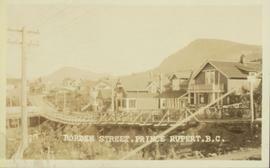 Wide angle view of Borden Street in Prince Rupert. Many residential buildings line the wooden road with railing. Printed annotation on recto reads: "Borden Street. 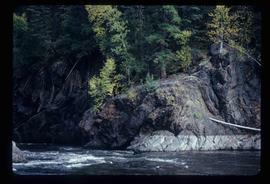 Prince Rupert B.C." 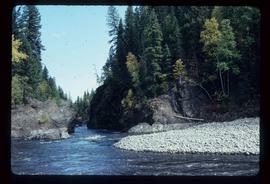 Photograph depicts forest growth near Woodpecker Island and Stone Creek. 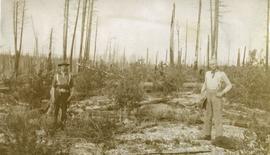 Photograph depicts two men standing in center foreground, forested flat land in background. 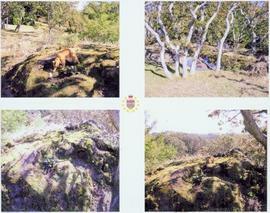 Photograph depicts forest growth with fallen trees and remnants of a forest fire.